International Women’s Day, also known as United Nations Day for Women’s Rights and International Peace was March 8th. Child Family Health International (CFHI) firmly believes, however, that we must reflect more than once a year on women’s empowerment, progress made, and steps we can take as individuals and organizations to push this initiative forward. In fact, front and center in CFHI’s tagline we highlight the importance of this as part of our everyday mission: Transformative Global Health Education and Community Empowerment. 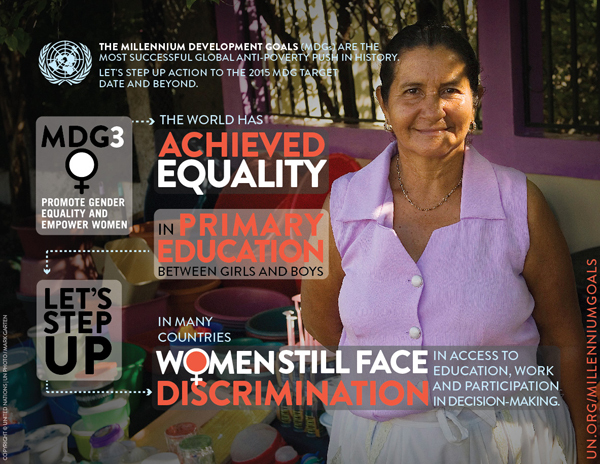 This includes working towards UN Millennium Goal 3 – Promote Gender Equality and Empower Women. Just a few weeks ago, in partnership with CFHI, Winnie and James Chang of Palo Alto, California hosted an event celebrating the recent opening of The Center for Empowerment of Young Mothers (EMJ) in Bolivia. The Changs are spearheading fundraising and donations for this project based in Bolivia working to empower young mothers. Bolivia is one of the poorest countries in Latin America and the education system is often underdeveloped. In addition, the rate of sexual violence is extremely high; 7 out of 10 female teenagers are assaulted. Many of these young women become pregnant, some as young as 14 or 15. To combat these issues and provide support to young mothers, the EMJ Center was created. It operates a facility in El Alto, Bolivia, staffed by doctors, nurses, administrators and volunteers and provides help to young women from all socio-economic backgrounds. In South America, young mothers are often impoverished, socially isolated, and have little education. Understanding the importance of education and improving their self-esteem is key to mobilizing change. Because South American women are usually in charge of the family, they play a very important role in society. The EMJ Center in partnership with CFHI works through education and empowerment so these women will positively affect Bolivian society at large. EMJ provides daycare services for more than 20 mothers, recreational activities for children and moms, and are launching a fair where mothers are able to sell crafts and handiwork they have created. Mothers at the center were interested in learning about family planning, so EMJ provides education on these issues as well as women’s rights and gender issues. CFHI and the EMJ Center are physically far away from one other, yet they strive for the same goal – to empower women. You can help this great cause and do your part to further United Nations MDG 3 and women’s empowerment by donating to support the EMJ Center. Help support young mothers in Bolivia: http://www.emjcenter.org/donate/. Thanks to guest bloggers Alexandria Tso and Nayanika Kapoor for contributing in part to this article. This entry was posted in CFHI Model, Local Experts and tagged Bolivia, cfhi, child family health international, community empowerment, el alto bolivia, EMJ Center, gender equality, Global Health, international women's day, La Paz, MDG 3, MDGs, millennium goal, palo alto california, poorest countries, reproductive health Bolivia, sexual violence, teen pregnancy, United Nations, united nations day, Winnie and James Chang on March 12, 2014 by Guest Blogger. Global Health Immersion Programs is an official blog of Child Family Health International (CFHI). CFHI Global Health Education Programs have been in operation since 1992. These programs have over 8,000 alumni, many of whom are leaders in global health and health equity movements.